When you look at Brian Kelly’s overall record there is little to nothing to complain about. His 68-34 record was much better than Charlie Weis (35-27), Tyrone Willingham (21-15) and Bob Davie (35-25). Weis, Willingham, and Davie all had the same profile. They racked up wins early in their Notre Dame coaching career and then faltered mightily, forcing the administration to make a change. Out of the three, only Willingham could argue that he wasn’t given a ample chance to succeed in South Bend. Since Lou Holtz, Kelly is the only one who gave Notre Dame a sniff at the National Championship. So why is his success under the Golden Dome always being questioned? It all lies in the team’s late season performances since their run to the National Championship game. Notre Dame’s record since against Alabama is 40-23 (.634). That is nothing to be ashamed of but when you take a closer look at the Irish’s late season record, during the time period, it paints a murky picture. 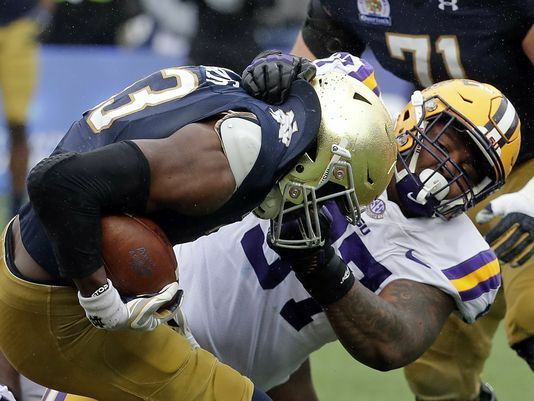 Notre Dame is 9-12 in November but 3-1 in bowl games after yesterday’s Citrus Bowl win over LSU. Recently, Kelly took aim at Notre Dame’s late season schedule. His point can be debated but what you can’t debate is, year in-year out, no one schedules as hard as Notre Dame. And maybe, just maybe, Kelly has a point. Maybe his teams are wearing down by the end of the year. It’s hard to see the Irish’s future schedules getting easier with their agreements in place and the ACC commitment. So is it time to take a look at the style of play that is so electric until the winter hits? It’s hard to tell. Whereas November has been so bad, when Kelly has had time to prepare for bowl games, he’s been very good in games where his quarterback has been good. In his last 3 wins, he’s beaten LSU twice. In both cases, the quarterback was the key. In their Music City Bowl win, Malik Zaire and Everett Golson both saw action but it was Zaire’s 96 yards rushing that lead the Irish to the upset of the 22nd ranked Tigers. In this year’s win over LSU, Kelly again used two quarterbacks and it was Ian Book’s arm that led a late drive for the win. With the schedule providing little to no break, the pressure on playcalling is immense. That puts more pressure on the Notre Dame quarterback than any other quarterback in the country. Yes… in the country. Notre Dame isn’t playing Louisiana-Monroe in November. There are no scheduled bye weeks when you have a South Bend address. Unlike teams in the power conferences, Notre Dame needs to be undefeated or really close to it, if they want to be considered for the College Football Playoff. Notre Dame starts each season a mile behind the Power 5 members and they don’t have the luxury to build an impressive record in a year when the conference is down like Alabama did this season. So despite the outdated and downright inaccurate narrative, Notre Dame doesn’t get every break because they’re Notre Dame. It’s the opposite. No school has a bigger burden than the Irish.